With thanks to Nicole Khan who supplied some of the feathers. 3rd Primary feather 8 (15.5 cms) With thanks to John Price. Primary feather 9 (11.8 cms) Top. 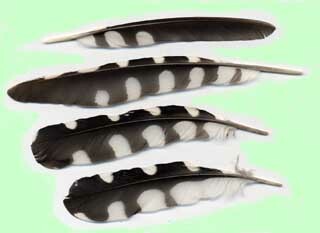 Secondary feathers 1 (10 cms) middle two. The shafts are broken and shortened. The outer edges have a golden-green colour. 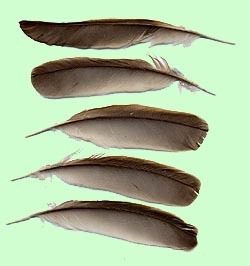 Six secondary feathers from one wing and two from the other. 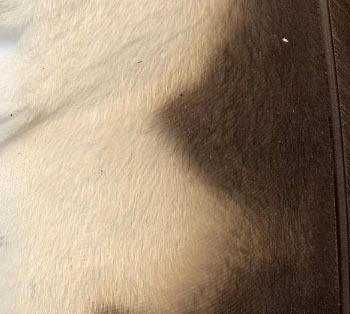 Underside of feathers are grey-brown. 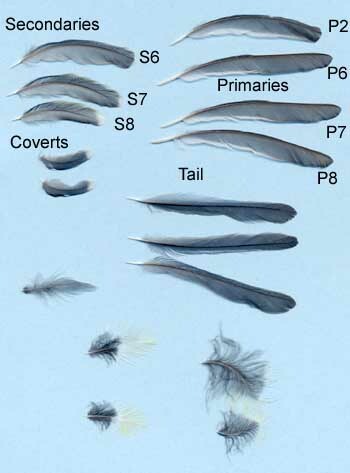 The leading edge of the upperside of the feather has a bluish sheen capped by a black band and the whole tipped white. 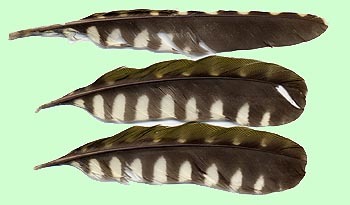 Other feathers tipped yellow ? breast. 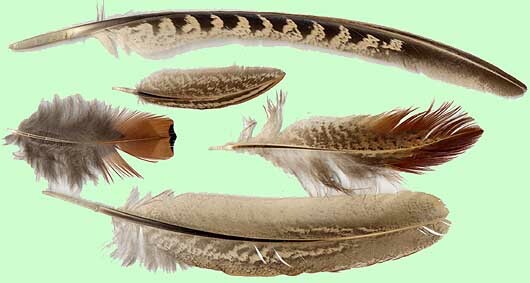 WOODPIGEON Tail feather 4 (18.0 cms) above. Primary feather (6 cms) top..
TAWNY OWL. 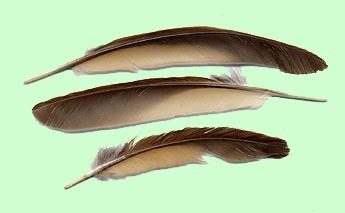 Left: Close up of feather showing furry upper surface which muffles the sound of flight, a characteristic of owls. 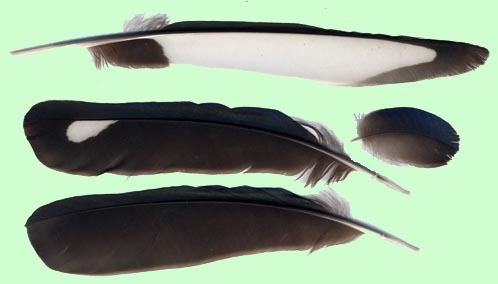 Right: Primary feathers (22 and 21 cms). Primary feather 7 (10 cms) top. Primary feather ?5 (9 cms) middle. Primary feather 6 (16.8cms) Top. Secondary feather 2 (14.0 cms) and Secondary covert (4 cms) Middle. Identification using "Tracks and Signs of the birds of Britain and Europe" by Roy Brown, John Ferguson, Michael Lawrence and David Lees. 2003. Christopher Helm, London.